Protective Enclosures Company (PEC) is a privately held, US-based manufacturer of affordable, lightweight, weatherproof and secure protective enclosures for TVs and digital signage. Manufacturer of the patent-pending The TV Shield® and The Display Shield® branded TV and display cases, PEC’s products are popular in both the residential and commercial markets. PEC stands committed to providing the most affordable and versatile protective enclosures in the industry. Prompted by a desire to create US-based jobs and manufacture the highest quality products, our enclosures are built with top quality materials and MADE IN THE USA in a 45,000 square foot manufacturing facility located in Pittsburg, Kansas. From top to bottom, the PEC team is committed to the research and development of solutions-based products to protect your equipment from harsh or extreme environments. Commercial and residential installers trust PEC’s proprietary patent-pending enclosures for installation in residential applications as well as arenas, stadiums, theme parks, restaurants, bars, airports, healthcare facilities, hotels, training facilities, government buildings, retail environments, institutions and many more locations. 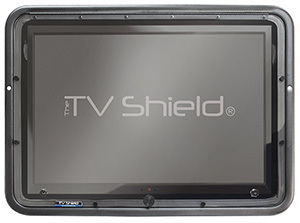 The TV Shield® is a weatherproof and secure enclosure designed for use with just about any standard TV and with the residential consumer market in mind. Ideal for both outdoor and indoor areas, The TV Shield’s lightweight universal design easily opens for a direct view of the TV, allowing you to watch, protect and secure most TVs in nearly any environment. Our enclosures protect TVs in over 23,000 residential and commercial locations and environments and 38+ countries worldwide. 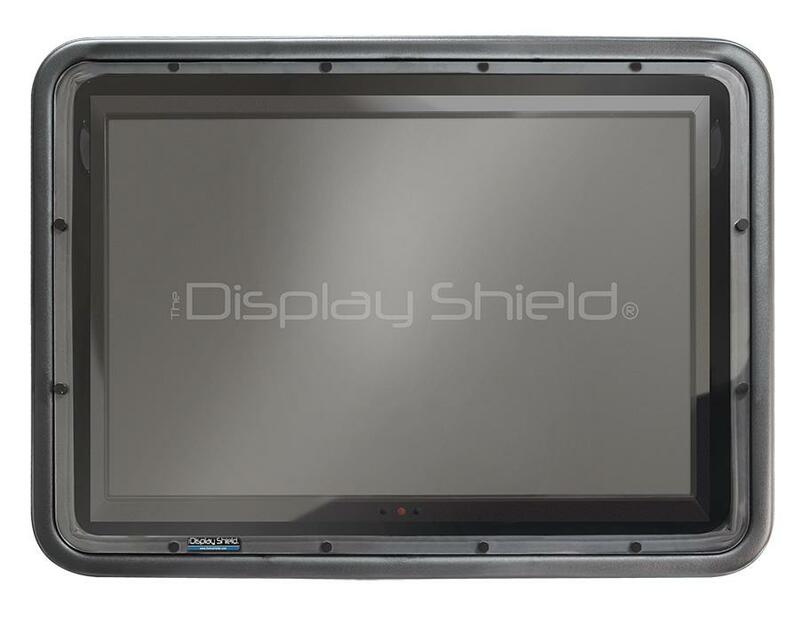 The Display Shield® is a weatherproof tamper-resistant enclosure, designed with a security screw system which provides added protection for flat panel displays and digital signage in high-traffic commercial environments. The Display Shield also offers protection against rain, theft, tampering and vandalism. Developed for the commercial market, The Display Shield is lightweight and comes in both vertical and horizontal models. 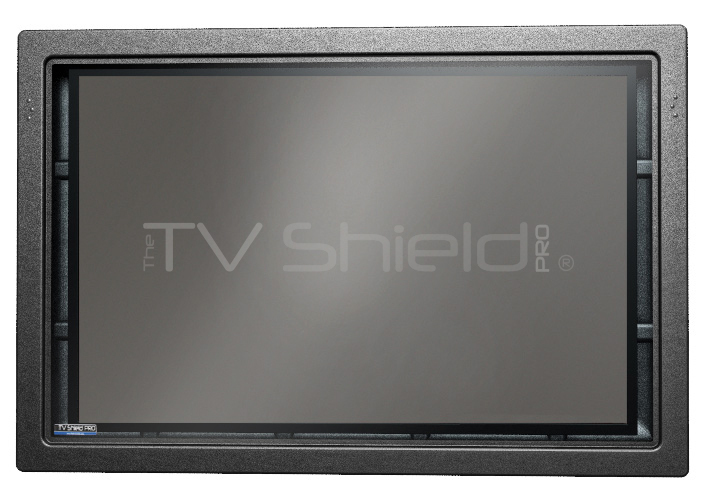 The TV Shield PRO is a weatherproof and secure lightweight enclosure made with a combination of aluminum and metal which is designed for use with any standard TV or digital display and is ideal for residential, commercial and professional markets. Developed for outdoor areas, The TV Shield PRO‘s unique design is much simpler to install than other heavy metal enclosures and opens with gas shocks for easy access to the display. The enclosure is available with acrylic or non-glare acrylic protective shields and features larger size options.